Pictured: USASBE President Pat Dickson, left, and EIP Director Jay Smith. The United States Association for Small Business and Entrepreneurship (USASBE) has selected the University of Maryland Entrepreneurship and Innovation Program (EIP) as the first-place winner for an Excellence in Entrepreneurship Education award in the Outstanding Specialty Entrepreneurship Program category, university officials announced today. A joint initiative of the The Honors College and A. James Clark School of Engineering's Maryland Technology Enterprise Institute (Mtech), EIP is a two-year, living-learning program for freshman and sophomore honors students that fosters an entrepreneurial spirit, creates a sense of community and cooperation, and develops ethical and innovative leaders. 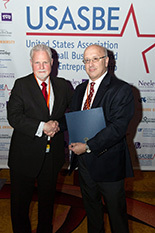 A leading voice in entrepreneurship research, teaching, and application, with over 1,000 members across the world, USASBE established the Excellence in Entrepreneurship Education Awards to recognize excellence in entrepreneurship education at the programmatic level. Each is awarded on a competitive basis, with only one institution winning in each category during a given year. "EIP is a growing and dynamic program," said Clark School Dean and Farvardin Professor Darryll Pines. "Few initiatives have made it to this national scale in less than four years. It is a testament to the passion and dedication of EIP Director Jay Smith, who not only lives and breathes the concept of innovative thinking, but also genuinely cares for each and every one of his students." The premise of the Entrepreneurship and Innovation Program (EIP) is simple: take some of the most talented students entering the University of Maryland and teach them how to apply entrepreneurial and innovative thinking to everything they do. Less than four years after the program's launch, its students are leaders across the university, winning competitions, starting new ventures, bolstering companies, non-profits and government initiatives, and spreading the mindset that an individual really can change the world. Students best describe the program's effectiveness. "Ever since EIP opened my eyes to the entrepreneurial way of thinking, my mind has been on fire," said Daniel Barotti, a junior mechanical engineer major who is simultaneously developing a system to improve the coordination of relief organizations during disasters, specially-lighted crosswalks to enhance pedestrian safety, and an online platform that donates money to charities when people play games online. "EIP Director Jay Smith taught us how to take a step back and re-evaluate everything. He encouraged us to start businesses and create the change we'd like to see in the world." EIP alumna Ashmi Sheth has interned with Maryland Lieutenant Governor Anthony G. Brown, served as a Changemaker for the social innovation organization Ashoka U, consulted for the banking-for-change company Agora Microfinance, and assumed multiple leadership roles in the Smith Undergraduate Student Association (SUSA). "The layout of EIP was like a thinking incubator," said Sheth. "What [Jay Smith] does is very difficult to teach—how to think differently. He brought in successful entrepreneurs and opened our eyes to thinking 'hey, maybe we don’t all have to work at a big company after college, maybe we can have the guts to just start something and change the world with it, especially our own communities.'" Residential Community: All students live together for two years in an EIP-designated residence hall, creating a strong community, promoting the sharing of ideas, and nurturing real entrepreneurial activity. Incubator Facilities: Two floors of the EIP residence hall were remodeled to create classrooms, project team rooms and program offices, making it easy for students to brainstorm, whiteboard ideas, and benefit from real-time coaching and mentoring. Experiential Learning: Students participate in experiential learning activities including simulations, case studies, creativity projects, outdoor challenge course, a social venture “gumball challenge,” rapid- prototyping exercises, co-curricular workshops, internships, guest lectures, business idea/plan development, presentations, and the creation of student-owned ventures. Many assignments are team-based to build skills in cooperation, negotiation and project management. Coaching and Mentoring: Program offices are located in the residence hall for easy access to coaching and mentoring. Students receive guidance on business ideas, the entrepreneurial process, or discuss career options. The program director has extensive international experience as an entrepreneur, corporate finance professional, consultant and professor of venture business. Challenging Academics: Students complete a series of four required EIP courses (9 credits) taken with members of their cohort. These courses focus on entrepreneurship fundamentals, assessment of individual strengths and interests, developing a personal entrepreneurship strategy, identifying contemporary issues and opportunities for innovation, international aspects of entrepreneurship, and, as a capstone, creating a for-profit business idea with social impact. Courses are taught by the EIP director, select university faculty and industry professionals. Impact Seed Fund: EIP students are eligible to receive grants from a $50,000 annual seed fund established for developing new ventures that make a positive social impact. Funds are to be used for research, product development, or working capital for students’ ventures. Start-up Discussion and Peer Feedback Meetings: Students readying to launch ventures are invited to join regular meetings to share their ideas with their peers and the program staff. The meetings help students develop ideas, identify issues to consider, and obtain other feedback and advice. Since 2010, EIP has grown to serve 170 freshmen and sophomores in the 2013-2014 academic year and supports 120 additional upper-level students who have completed the program's course sequence. EIP students are among the highest academic performers at the university, representing a wide variety of fields of study, including business, engineering, sciences, mathematics, agriculture, linguistics, government, psychology, and architecture. Over 40 percent of the program's freshmen are women. EIP students have formed ventures in areas such as mobile applications, electrical/electronic devices, internet/web development, military/law enforcement, real estate, specialty apparel, gaming, niche social media, and social ventures. Dozens of others are evaluating ideas to pursue. In addition, students have worked for Amazon, Google, Texas Instruments, Toyota, and Under Armour, as well as NASA, SAIC, Orbital Sciences, NIST, NIH, FDA, and Northrop Grumman. They have won case competitions sponsored by Deloitte, Unilever and Target. "Jay Smith and the EIP students are changing the university every day, for the better," said Honors College Director William Dorland. "It is wonderful to see their efforts recognized at the national level. There will be more recognition to come, I am certain." "We are honored to be recognized for excellence in entrepreneurship education by USASBE, one of the most influential organizations in the nation for supporting entrepreneurship and small businesses," says EIP Director Jay Smith. "We are committed to continually improving a model program to spur entrepreneurship and innovation, two of the key economic development drivers for creating jobs and bringing new products to market. For students, entrepreneurship is a fantastic vehicle for self-expression and self-actualization, giving them a chance them to pursue their dreams while creating value for society." View a video about EIP made by students in the program, as well as student profiles and photos, at: http://www.mtech.umd.edu/news/press_releases/eip_usasbe_award_2014.html.